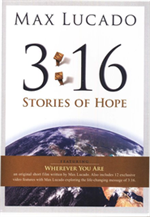 Aimed both at established evangelical Christians and those seeking deeper spiritual truth, theologian Max Lucado's release Max Lucado 3:16 Stories of Hope incorporates two halves. The first, a short film entitled 'Wherever You Are,' dramatizes the story of a teenage woman named Katherine Fisher who sinks helplessly into an ugly, sinful lifestyle, only to find that she needs the hand of Christ to pull her out. In the second portion, Lucado headlines 12 short films, in which he leads viewers through the meaning and message of the salvation verse - John 3:16.